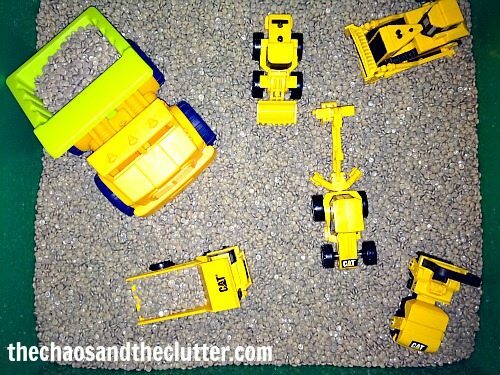 In my experience, construction themed sensory bins are a big hit with boys (and girls) and are so easy to put together. 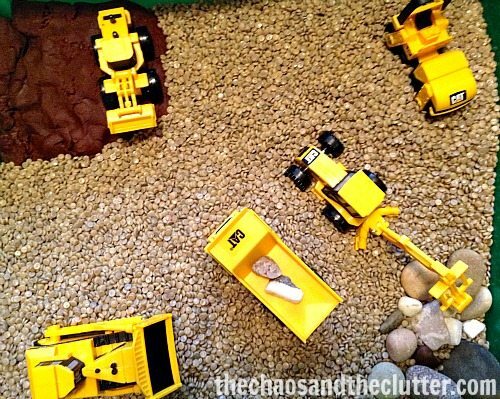 I’ve actually made two types of construction sensory bins because the kids don’t seem to tire of this theme. For the first bin, I just used sand coloured Kidfettti as the base and just threw in a bunch of construction toys. The kids enjoyed scooping and playing. A few months later, I made a different sensory bin with this theme. This time, I put a bit more than one minute into making it and I have to admit that the kids did spend longer periods of time playing in the second one than they had the first! I again used Kidfetti as the base. I like that it’s very easy to clean up, doesn’t get ruined if it gets wet and is smooth. It works well for a construction bin. I added chocolate playdough into one corner so that the kids could pretend it was mud and a pile of rocks into another corner before adding the construction vehicles. I will be featuring sensory activities every day this week in celebration of the launch of my new eBook, Sensory Bins. 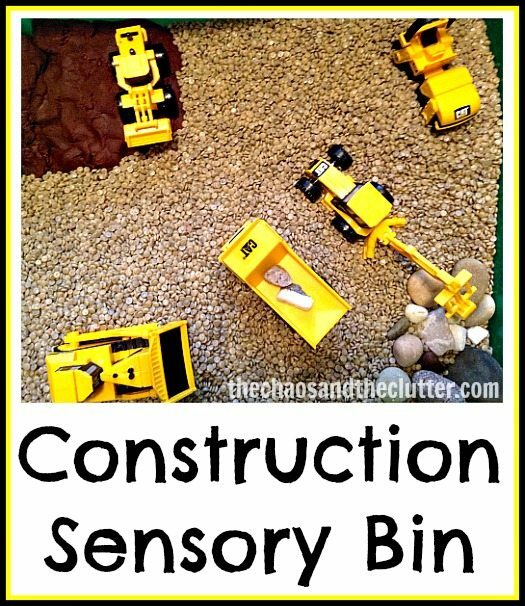 For more sensory bin ideas, you may want to follow my Sensory Bins Board on Pinterest or check out our family’s favourite sensory bins. This Monsters Sensory Bin has got to be one of my all time favourites. The little sponge monsters with the googly eyes are pretty darn adorable! Last week, I made a Monsters themed sensory bin. This was such a fun bin to create and for the kids to play with. As the main base, I used fuzzy, glittery pompoms. I added a BumbleBall Jr. (when you pull the string, it bounces about), a wooden monster, lots of squishy sensory balls and creatures, colourful links, googly eyes, and kitchen sponges that the kids made into monsters. 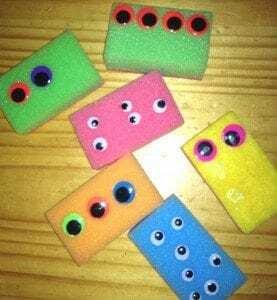 To make our little monsters, all we did was glue googly eyes onto kitchen sponges. 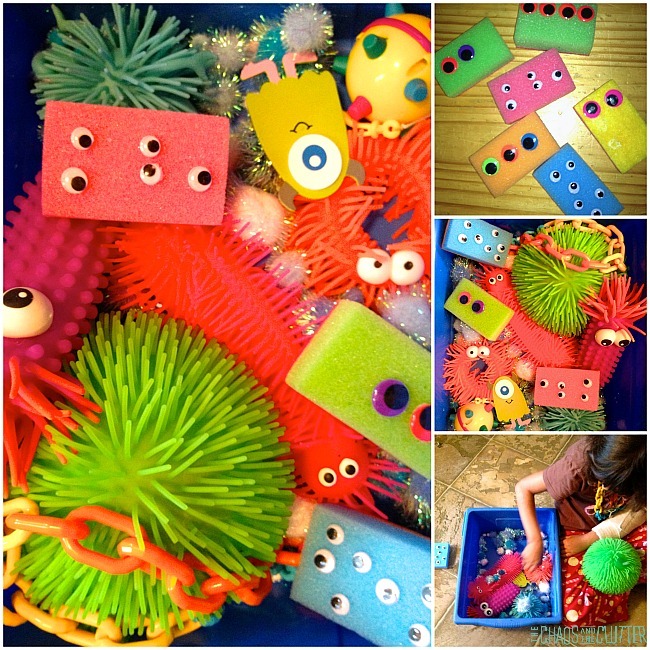 They were fun to make and were a great addition to the monster sensory bin. My kids really enjoyed this sensory bin. Their favourites were the large sensory ball that contained a light up ball inside that jiggled around and the BumbleBall. They also enjoyed using the colourful links as a necklace while they played. 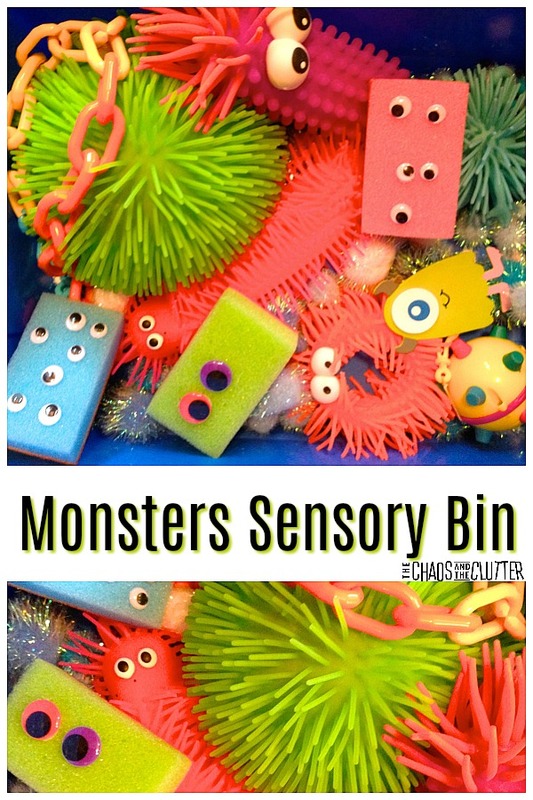 This monster sensory bin is especially fun for kids who love the Monsters movie. You can add in some of their favourite characters from the film. 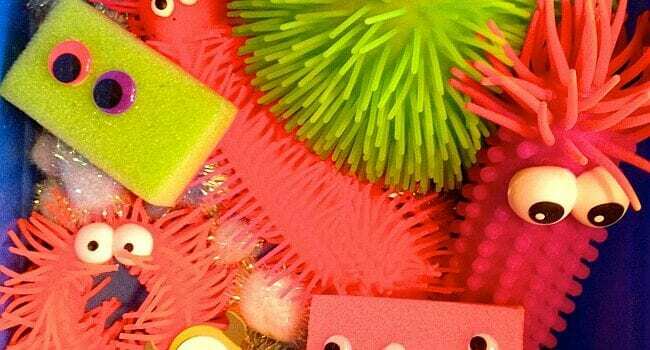 There are a variety of textures includes because of the squishy sponges, the hard plastic on the links and the Bumbleball. There are also lots of other textures to explore with the wood, the fuzzy bits on the pompoms and on some of the sensory balls. 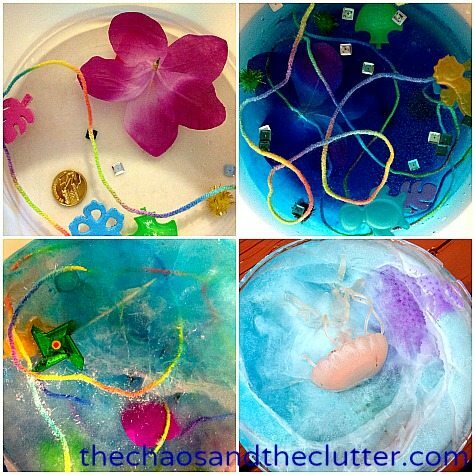 Be sure to use caution if making this sensory bin for little ones. The googly eyes can come off the sponges, especially if they chew on them and that could pose a choking hazard. As with all sensory play, adult supervision is recommended. If you are looking for more sensory bin ideas or information, you may be interested in my book. Join me for a free 5 part email series Sensory Solutions and Activities and get a free sample of our Sensory Play Recipes eBook. Today I am officially launching my new eBook, Sensory Bins: the What, the How & the Why. We’ve been using sensory bins in our home now for a few years and they have helped my kids tremendously. 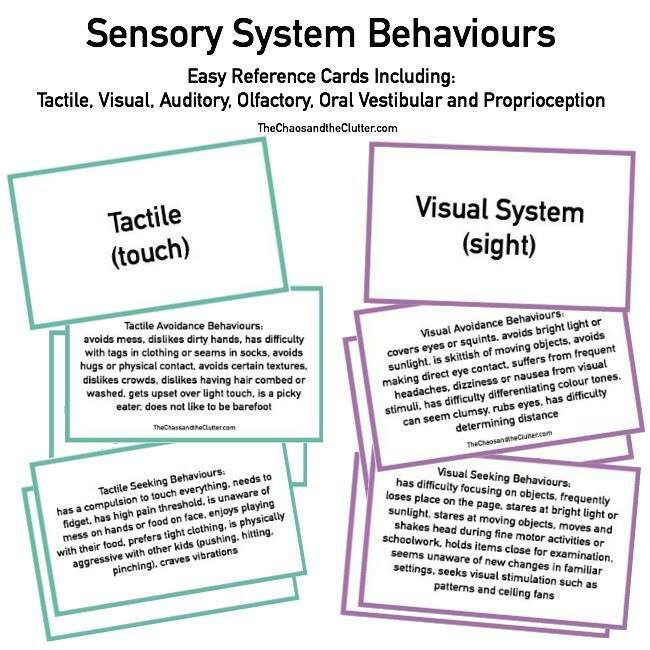 Four of my kids have SPD (sensory processing disorder) and of all the things we’ve tried, sensory bins have been the easiest to implement and have had the greatest impact. I first decided to write a book about sensory bins when I noticed how many moms had never heard of them. We would have kids over to play and they would naturally gravitate towards the sensory bin. It didn’t seem to matter whether it was a child with sensory issues or not and I noticed that kids of all ages were enjoying them. Moms would comment to me that usually an activity is never able to hold their child’s attention for more than a few minutes and yet they would play with my sensory bin for between fifteen minutes and an hour. The moms were astounded and wanted to learn how to make their own. I began telling more and more people about them, fielding questions and sharing ideas. This led me to the idea of putting all the information in one place that is easy to access and can reach more people. In the book, I share information about how to assemble sensory bins, explain why they are important, provide storage tips, share recipes for different types of sensory dough, and have printable lists of ideas for sensory bin bases, containers and items to fill them with. I hope that this guide will help others to easily create these wonderful hands-on learning experiences for their children or students. 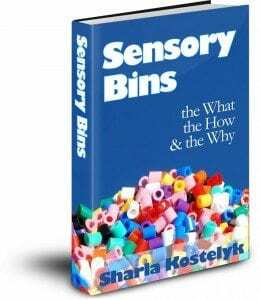 Sensory Bins: the What, the How & the Why is available to purchase for $2.99 on pdf, Kindle, Kobo, or Nook. To celebrate the launch of this new book, I will be featuring a sensory bin or sensory activity each day this week. I’d love it if you’d help me spread the word! This is something that I’ve had planned for awhile. It’s even something I put in my Summer Bucket List. This is the one thing in this 5 Days of Summer Sensory Activities that did cost more than a few dollars. I went to the bank and bought a roll of quarters ($10) and a roll of nickels ($2) and hid them in our sand pile. If you don’t have a sandpile, a box of rice or dried lentils would work just as well. I then let the kids dig and sift to their hearts’ content but I made it clear beforehand that all money found would be pooled at the end and divided equally among them so that there wouldn’t be any fighting. Another idea I had that would work well for a traditional sandbox would be to rope off sections using ribbon or tape and assign each child a section, being sure to put equal amounts of money in each section. 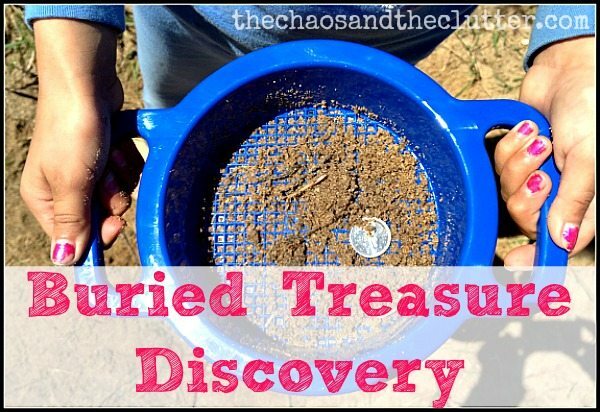 Or of course, you could divide up the money beforehand, hiding it one bit at a time and letting the kids search one at a time but that would take far too much time in my opinion and may lead to complications if one child weren’t able to find all of his treasure. It’s obvious that we have had fighting occur with things like this in the past since you can tell that I’ve put quite a lot of time into thinking about that aspect of it! If you are the parent of an only child or children that never squabble, it’s lucky that you won’t have to make those considerations! I have to say that it was pretty fun watching them explore and find the coins. I’m glad that I did this with actual money. In the past, I’ve done treasure hunts with pretend coins and it’s still really fun for them but this was such an unexpected surprise that they could hardly believe it! They talked about what they would do with all their riches afterwards! For more fun activities, you may want to follow my Kids Activities Board on Pinterest. This was one of those activities that probably was better conceptually than it actually was in reality but the kids were just happy to have an excuse to get to eat a freezie! I used fingerpainting paper because it is glossy and doesn’t tear easily. Incidentally, this seems to be my go-to paper for all edible art projects as it is also what we use for pudding painting and condensed milk painting. 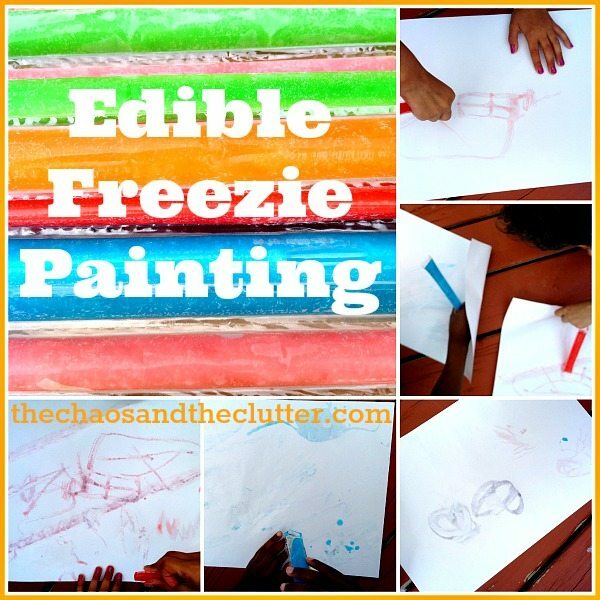 This is as simple as cutting the tops off of store-bought freezies (or making your own) and handing them to the kids to paint or drip onto the paper. Some of the kids chose more of an abstract creation while some chose to make shapes or houses or trees. 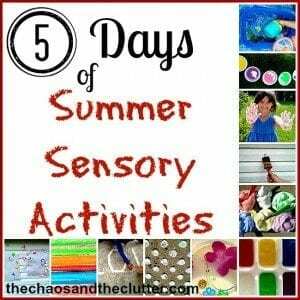 This is part of my series of Summer Sensory Activities. I find that it’s so much easier to think of fun sensory activities when the weather is nice! 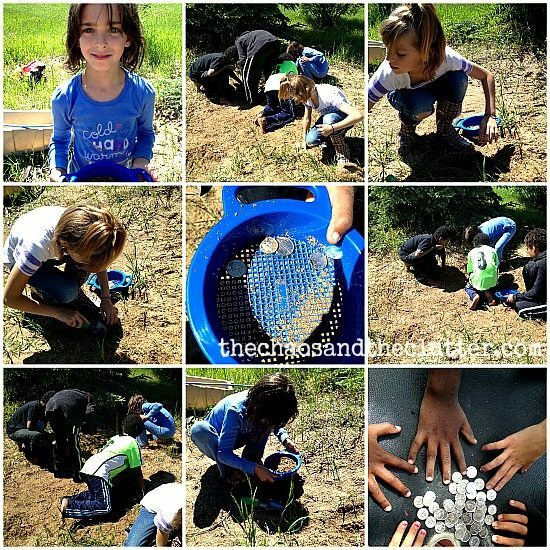 While this activity did require some prep work on my part, it was so worthwhile because this kept the kids occupied for a very long time! 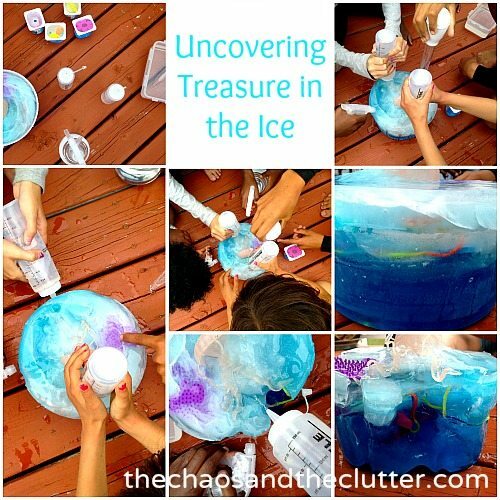 I actually made one big frozen treasure find for the kids all to work on together and then little ones for each of them just for fun. For the individual ones, I used empty yogourt containers and put a few small items in each. I used glittery foam stickers, sequins and pompoms. I then filled them with water and froze them. The little ones were much more challenging to unmold than the big one was, but after having them sit in water for a minute, they came out easily. The larger one took more time to make as I made it in layers. 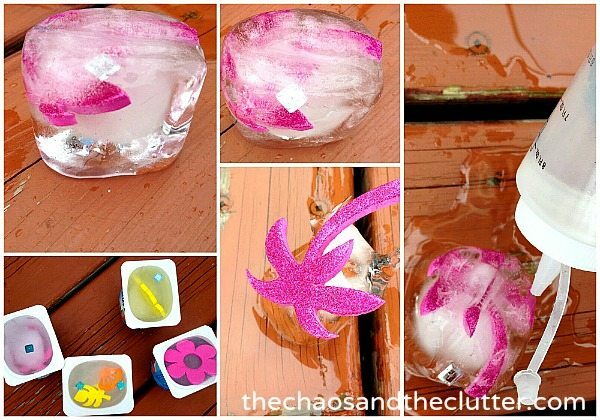 I used an empty ice cream bucket and placed some items at the bottom before adding a layer of water. 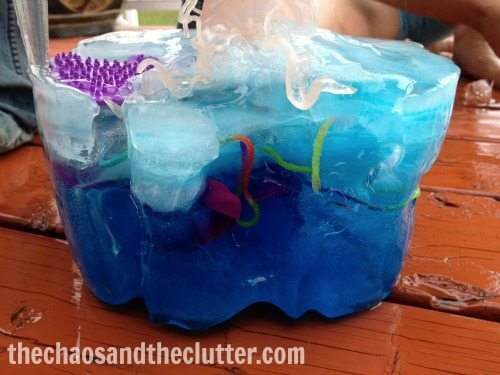 I then put that in the freezer and when it had set, I added a few more items and a layer of water that I had added some blue food paste to so that it created layers of blue. The interesting thing is that the layers of regular water I added afterwards each took on a bit of the blue but less with each layer, creating a really cool effect that was completely unintentional! The weather hadn’t been great, so I wasn’t in a rush to complete this and took a few days of adding layers here and there and keeping it in the freezer in between. 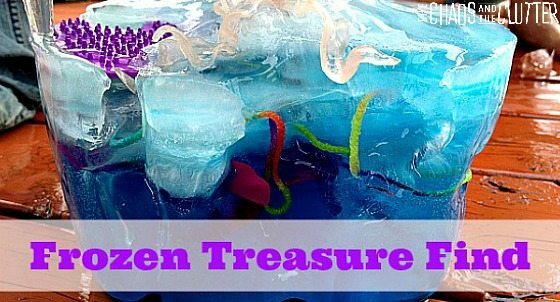 For the “treasures”, I used a few play coins, sequins, ocean life shaped ice cubes, pompoms, silk flowers, foam stickers, string that I wound through the layers, toy fish, and mini pinwheels. I tried to stick with a summer theme. I ran the bucket under the water for a few seconds to release the ice creation from the ice cream pail and set it outside for the kids to play with. They used spray bottles, squirt bottles, a turkey baster, and plastic spoons to try to release the treasures from the ice. This occupied them for a long time and it morphed into a bit of a science project as they decided to experiment with different temperatures of water in their bottles and with different techniques. It was also a good way to cool off on a hot summer day! 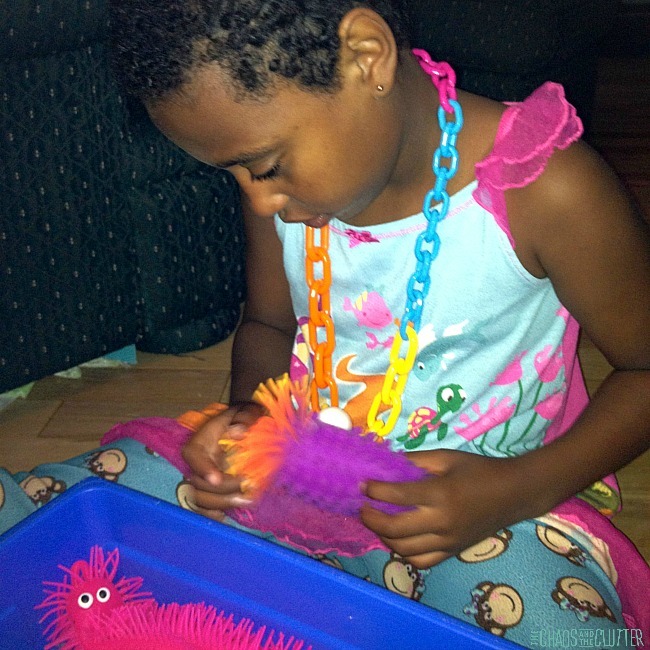 This project is part of my series on Summer Sensory Activities.